Collectionof went live today, a new online platform that allows artists and art spaces to exhibit special objects that speak to their creative production. 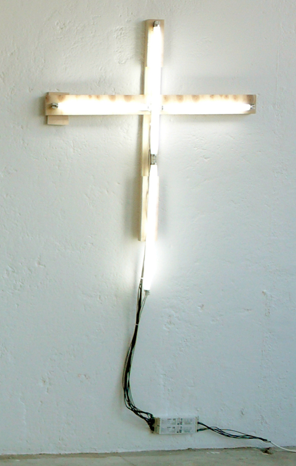 Perusing Collectionof, many of these "special objects" are not keepsakes or personal items, which one might assume from the site's title, but artworks and editions, like Alan Vega's crosses or an infinity room designed by Tauba Auerbach and Hannes Hetta. (Both very cool items, I might add.) There are a few exceptions, like Scott Ponik's section which includes some of his idiosyncratic book finds such as The Making of Kubrick's 2001 and Vicious Circles and Infinity: An Anthology of Paradoxes. Judging from the stellar list of participants so far, which range from Istanbul-based independent art space Marquise Dance Hall to Miami's Bas Fisher International to artist Cory Arcangel and musician C. Spencer Yeh, it will interesting to see how Collectionof develops.